So far, there’s no cure for this disease yet but don’t worry about me, the infections only will last for 1 month. Egg will take good care of me during this period of time! For your information, I’m diagnose with the “FOOTBALL FEVER”! *cough! cough! With the 2010 FIFA World CupTM set to kick off in South Africa tonight football fever has started spreading across Malaysia like an epidemic. Almost everyone is crazy about football! 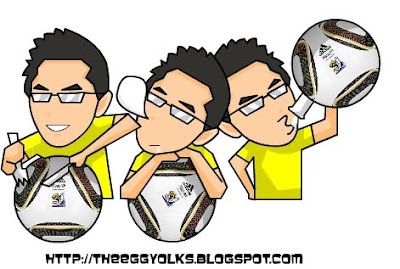 Makan Bola? Tidur Bola? Minum Bola? However, I don’t think everyone is on the same side! Who do you support? Egg still supports England (even though David Beckham is not in the game this year). As for me, Portugal is my favourite team! Who will be in the finals? Definitely not England! *slapped in the face by Egg! Guess what, our local DJs are also a super fan on 2010 FIFA World CupTM! I stumbled across this video in you tube! They are just hilarious!! DJ Jane and DJ Fara were fighting each other for the 2010 FIFA World CupTM! They sabotage each other through their cunning tricks! Somehow I find it fun to watch people sabotaging one another and see who’s with the most cunning plan! How about DJ Jane and DJ Fara? Who will win in the end and crowned with the “King of Sabo!”? Here’s the all 3 episodes of the battle between DJ Jane and DJ Fara! If you think that fighting head-on hurts, why not fight through the “Footie Gladiators” by Castrol Malaysia! Not only that you won’t hurt yourself, you can even win great prizes!! 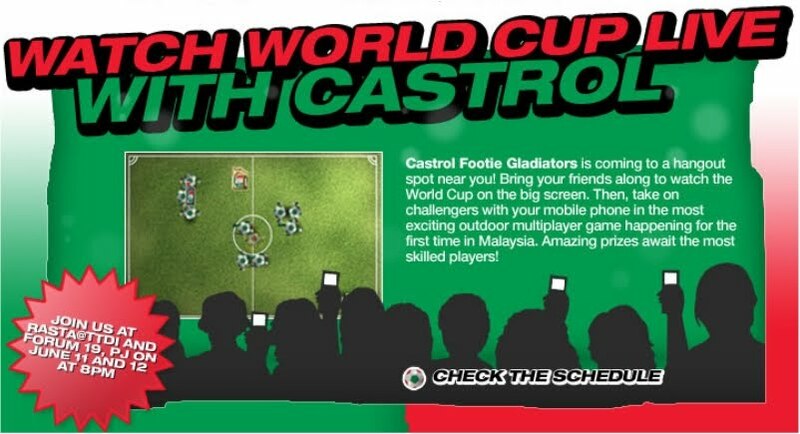 Other than that, Castrol Footie Gladiators is going to Rasta@TTDI and Forum19, PJ on June 11 and 12 at 8pm! Bring your friends along to watch the matches of South Africa vs Mexico and England vs USA! Other than that, there will be an outdoor multiplayer game happening where amazing prizes await the most skilled player! Log on to http://www.facebook.com/castrolmalaysia for more information!